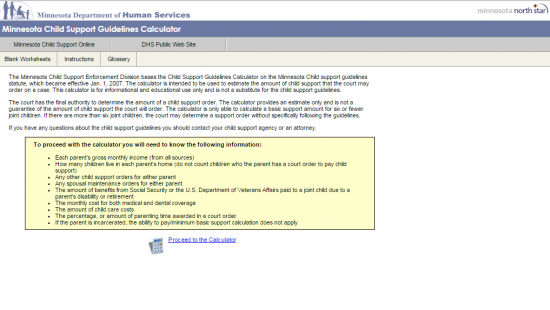 The Minnesota Child Support Calculator is an online tool for parents to use to estimate how much child support they may owe or are owed. The amount calculated is just an estimate and may be adjusted by a court order depending on the specific circumstances of the case. What is Parent B’s name? What is the IV-D case number? What is the court file number? How many joint children are there? What is the monthly income received? What is the potential income for each parent, if any? What is the monthly amount the joint child(ren) receive in benefits from Social Security or the U.S. Department of Veterans Affairs (VA) due to a parent’s eligibility? If the joint child(ren) receive Social Security or VA benefits due to Parent A’s eligibility, is Parent B the representative payee? What is the monthly amount each parent is ordered to pay for spousal maintenance? What is the total amount each parent is ordered to pay for monthly child support for nonjoint child(ren)? What is the number of nonjoint child(ren) living in the home? What is the monthly cost of health care coverage for the joint child(ren)? What is the monthly cost of dental coverage for the joint child(ren) if separate from health care coverage? What percentage of parenting time was awarded to Parent A by the court? Number of joint child(ren) receiving child care? How much are the total monthly child care costs? Which parent incurs the child care costs? 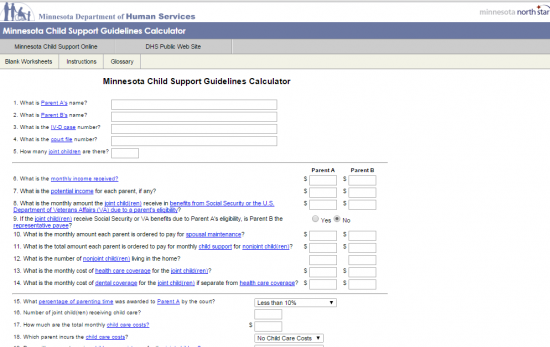 Does either parent receive child care assistance for the joint children? 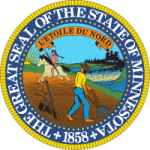 Does Parent B receive Medical Assistance or MinnesotaCare for the joint child(ren)?